Yet again, students from the Puerto Williams School who participate in the Omora Workshop on Natural History have taken first place in the regional science fair, sponsored by Explora-CONICYT. This year, the Omora-Puerto Williams team was represented by two groups from primary and high school. The first team, including Carlos Saavedra and Francisco Olivares, won FIRST PRIZE in the elementary student category. These students were led by Tamara Contador, a Ph.D. student in Biology from the University of North Texas and the Institute of Ecology and Biodiversity, and teacher Maria Anguita. They presented their work on Richness and abundance of freshwater invertebrates in submerged rocky and wood habitat of the Ukika River, Navarino Island, Cape Horn Biosphere Reserve (55º S). 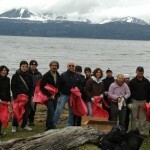 As part of a way to integrate families and a diversity of ages, UMAG local environmental education coordinator Cristobal Pizarro organized a trash pick up day on the north coast of Navarino Island, near Puerto Williams. The activity had the participation of the Chilean Navy and the Blanca Estella Foundation and was supported by the Cape Horn Municipality and the Institute of Ecology and Biodiversity. A follow up activity is planned for the 24th of October. The Omora Park and the Sub-Antarctic Biocultural Conservation Program (joint efforts between the Universidad de Magallanes, the University of North Texas and the Institute of Ecology and Biodiversity) were recently awarded second place in the 2010 Raanan Weitz Competition, an annual, worldwide call for proposals on innovative strategies to achieve sustainable development. Theory meets practice in this model framework that uniquely integrates philosophy and ethics with real life working applications in ecotourism and conservation. The success of sustainability hinges, in part, on making the results of academic pursuits more accessible to larger audiences. 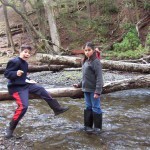 ‘This project is an example of academic research engaging both university and local communities; not only does it facilitate the dialogue on conservation with collaborators throughout the Americas, but it also provides a meaningful context for local individuals and institutions to learn the value of place through the lens of multiple academic disciplines – from the humanities to the sciences – and also the value of traditional ecological knowledge from multiple cultural perspectives’ says Dr. Christopher Anderson, coordinator of the Sub-Antarctic Ecosystems and Biocultural Conservation research cluster.